For allegedly stealing two laptops valued at N1.2million, a 40-year-old businessman, Nurudeen Abdulraman, on Thursday appeared before an Ikeja Magistrates’ Court in Lagos. 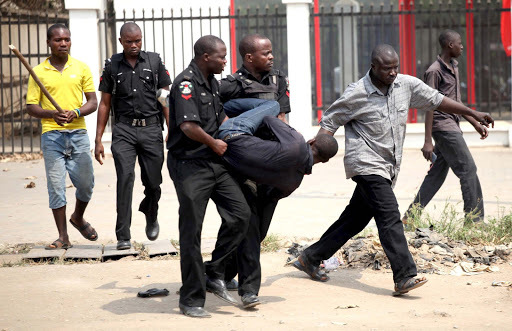 Abdulraman, a resident of Badagry, Lagos State, is being tried for stealing. The accused committed the offence on July 30 at Victoria Island, the Police prosecutor, Sgt. Dada Wasiu, told the court. He said that the accused stole two laptops, property of Brainwave Technology Nigeria Ltd.
Wasiu said that the management resumed work on Monday to discover that the two laptops in the chairman’s office were missing. “The company discovered that two laptops have been stolen, but the door and key to the office were not tampered with or damaged. “They later detected that the aluminum and wood partitioning their office with the accused’s office has been tampered with. The accused denied committing the offence and was admitted to bail of N500, 000 with two sureties in like sum. The Magistrate, Mrs A.K Dosunmu, said that the sureties should be gainfully employed and show evidences of two years tax payment to the Lagos State Government. Further hearing has been fixed for Sept. 20.